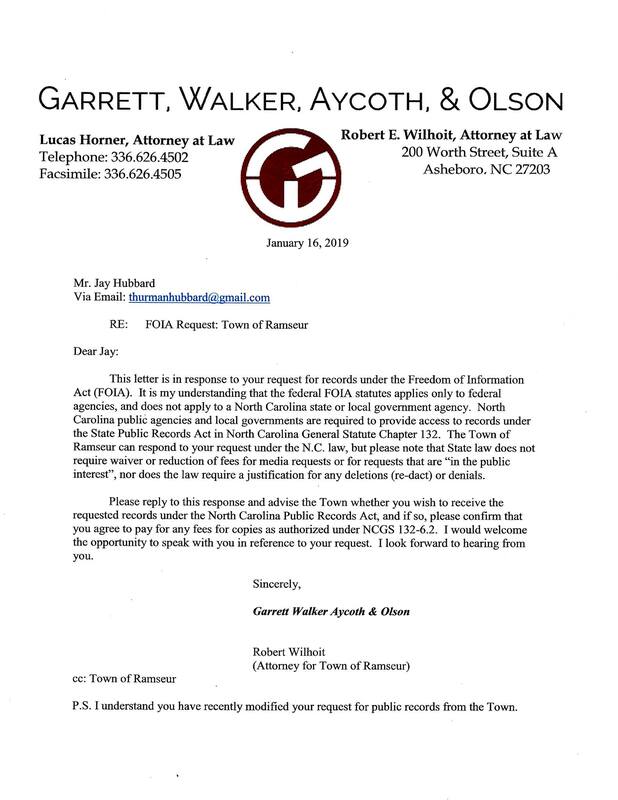 On Friday, January 11, 2019, I decided to request a few public records from the Town of Ramseur, so I emailed our Town Clerk, Bobbie Hatley. This is what I sent. I would like to obtain the following records under the Freedom of Information Act. Hard copies of all incoming and outgoing email to all commissioners, the mayor, town clerk and water billing clerk, January 1, 2018 to present. Hard copies of all cellular telephone bills for all phones issued to commissioners or the mayor, town clerk, and water billing clerk, January 1, 2018 to present. Hard copies of all invoices and payment receipts for the following departments, to include vendor names, amounts billed/paid, and dates, and a description of services or goods purchased/received, January 1, 2018 to present. On Tuesday, January 15th, I received the following response from Ms, Hatley. I have not begun to work on this request at this time. I am in the middle of water billing and tax preparations right now. I will be in touch. I emailed her back and told her I would stop by her office later that day to discuss my request and “may be able to save you some work.” When I got there I was welcomed into the Clerk’s office and told her that if she would make me a copy of the Randolph Health Community Foundation grant application submitted in August of 2018, I would reduce my request by about 90%. Ms. Hatley immediately retrieved the document from her files, scanned it and emailed it to herself and placed it on a USB memory stick I provided. At that point I crossed off most of the list posted above from a printed copy of the email I had brought with me, leaving only a request for invoices and receipts for maintenance and repairs to Sunset Knoll Cemetery, our branch library, and Ramseur Lake, excluding recurring bills such as monthly utilities. Ms. Hatley informed me that my request would take some time to fulfill since they were in the middle of printing water bills and she was working on 2018 tax information which by law is supposed to go out before January 31st each year, but two days later, on January 17th, I received a letter from the office of attorney Robert Wilhoit. If you click on the image to the left it should open up a copy large enough to read. 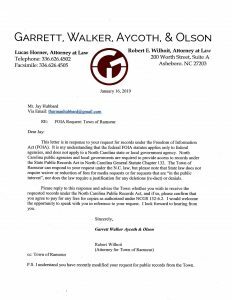 Essentially, the letter says that municipalities in North Carolina are not covered by the federal Freedom of Information Act. To get public records here one must make their request under the North Carolina Public Records Act, found in Chapter 132 of North Carolina General Statutes. There is also a common misconception that government agencies cannot charge citizens for access to public records. This is only partly true; they can charge us “reasonable” fees to offset the cost of printing or labor required to comply. In Ramseur this works out to about $0.25 per printed page. The grant application I requested was delivered in the form of a PDF document which I received at no cost. After receiving Counsellor Wilhoit’s letter I further refined my request and resubmitted it this way. I am hereby requesting, under the North Carolina Public Records Act, copies of ALL invoices, receipts, and correspondence relating to repairs and/or maintenance of Sunset Knoll Cemetery, which is owned and maintained by the Town of Ramseur, excluding invoices and payments for utilities, grave opening services, and lawn maintenance (grass cutting/trimming). Specifically, I want to know who was paid, how much they were paid, when they were paid and what product or service was provided, and what method of payment was used. This shall include masonry work, electrical and lighting installations or repairs, painting, landscaping/shrubbery removal or planting, and any other non-recurring expenses from January 1, 2018 through January 18, 2019. This request is made in accordance with NCGS 132-6.2. I will accept copies in digital form (PDF), as Ms. Hatley has already demonstrated a willingness to provide, or in physical form (paper copies). I understand I may be charged a fee of $0.25 per page copied. Digital copies may be emailed to this address or, upon request, I will provide Ms. Hatley with a USB memory stick (a.k.a flash drive) for the purpose of delivering said media. This request supersedes all previous requests. I’m still waiting for this request to be filled, but I made another much smaller request for an email this morning, referencing the same statute, and received what I asked for just before the close of business today, so it does work. I appreciate Ms. Hatley’s quick response to this request. 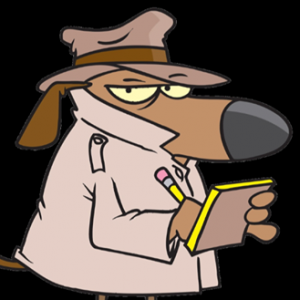 If you request records that might be useful to the Watchdog, such as meeting minutes, invoices, contracts, etc., feel free to contact me at RamseurWatchdog@yahoo.com. I’d love to hear from you and your privacy will be respected and protected to the fullest extent of our my ability.